New Zealand Greenshell™ Mussels are a unique mussel variety found only in New Zealand’s isolated waters. Greenshell™ Mussels from New Zealand are prized for their large plump meat and sweet, tender taste, vibrant emerald green coloured shell and are often referenced for their health benefits, which has made them a sought after delicacy around the world. With their robust shell New Zealand Greenshell™ Mussels are available in a ‘ready to use’ frozen half shell format, where all the hard work of cleaning, opening and discarding of unwanted shells has already been taken care of, making them easy to prepare and available to use when you require. 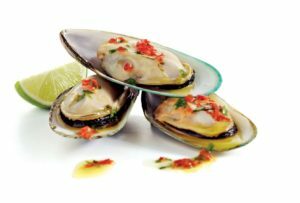 New Zealand Greenshell™ Mussels are masters of versatility, making them a popular choice on catering, bar and restaurant menus. The shell adds visual appeal to any dish, and the understated mussel flavor profile lends itself to a broad array of ingredient partners and cuisine styles. In New Zealand, we are also acutely aware that the world wants food that not only tastes wonderful but carries with it firm assurances around food integrity, therefore we actively ensure that our mussels comply with the highest standards of food safety. In all these respects, New Zealand Greenshell™ Mussels shine as rare and precious culinary gems. New Zealand Greenshell™ Mussels are convenient and easy to prepare. They are well suited to many types of preparations including saute, frying, baking, steaming, broiling, stewing and grilling. Preparing New Zealand Greenshell™ Mussels If frozen, New Zealand Greenshell™ Mussels can be thawed before cooking or alternatively prepared from frozen. Thawing Thawing frozen mussels prior to preparation is recommended for baking, grilling and frying recipe applications. Quick thawing can be achieved by running cold water over the mussels for 10 minutes, moving them around to ensure all are properly defrosted. Conventional thawing can be achieved by placing mussels or sealed bag in the refrigerator for 5-8 hours, draining off excess liquid prior to using. Cooking Care should be taken not to overcook New Zealand Greenshell™ Mussels with the best results achieved when cooking until just heated through. Storage New Zealand Greenshell™ Mussels must not be over-thawed, refrozen or left sitting in their own juices or water. Once thawed use New Zealand Greenshell™ Mussels immediately. Frozen New Zealand Greenshell™ Mussels will retain their quality for up to 24 months if stored at or below 0°F (-18°C). Please refer to product best before date for further detail on the shelf life of individual products.